Constantly increasing human population requires that the crop production including those of legumes be enhanced rapidly to fulfill the food demands across the globe. In order to optimize pulse production, growers generally apply agrochemicals including fertilizers and pesticides. However, the excessive and uncontrolled use of such chemicals has resulted in reduced crop production besides their adverse impact on environment. In order to protect losses in soil fertility and to preserve environmental quality, the use of inexpensive and eco-friendly microbial preparations (biofertilizers) has been exploited in farming practices with remarkable success. Among various plant growth-promoting rhizobacteria (PGPR), the associative nitrogen-fixing PGPR, belonging to the genus Azospirillum, has long been employed as microbial inoculant worldwide to promote legume production. Azospirillum, when used as inoculant, increase the production of root hairs and root growth which in effect benefit plants with better absorption of water and nutrients. The inoculation of Azospirillum either alone or in combination with other beneficial PGPR has been found to increase N2 fixation and concomitantly the grain yield of legumes. 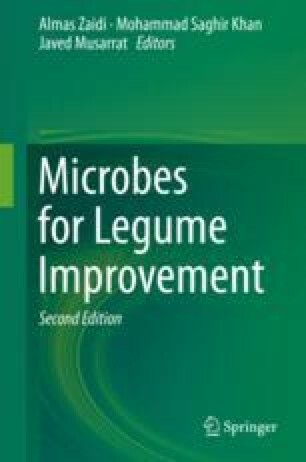 Considering the importance of Azospirillum, this chapter highlights the role of Azospirillum in the production of legumes in different agronomic setup.